ON the 4th day of July 1907 Probate of this will and three codicils was granted to Henry Mossop and Charles Mossop and Walter Mossop the executors. John Mossop was baptised on 28 October 1830 at Long Sutton, Lincoln. He married Elizabeth Cross on 11 July 1857 at the Parish Church, New Brentford. He died on 16 May 1907 at Lincoln Lodge, Wealdstone, Middlesex. 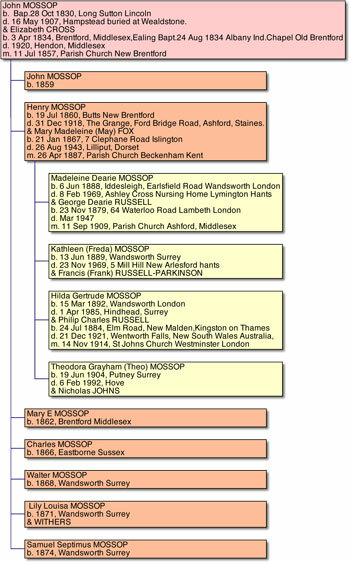 John was the son of Robert Mossop and Mary Elizabeth Peele. In his father's will John was left: £500, Reversion in about 28 acres of land in the feu of Tyd St. Giles, Cambridgeshire. Late the property of Robert’s father Revd. John Mossop, House in Eastbourne, Sussex, Piece of land in Bees Lane, Tyd St. Giles late the Honourable Russell. 1 acre and a rood of land in or near Newton, Cambridgeshire late Thomas Howard. 11th part of residual estate after the death of mother. 8th share as tenant in common in Estate in America known as entry No. 385 Land Office, Scott County, Tennessee containing about 5100 acres. Mothers will left him: Parcel of land on Sutton Common of 9 acres 2 roods 36 perches No. 115 on Award Map formerly holden of the Manor of Sutton Guanock. Mary E. was admitted tenant after the death of her father. Land has now been enfranchised so she can give or devise it to John. 2 Parcels of grassland in Balkins Drove and Bird’s Drove, Sutton St. James, Lincs. He has the portrait of her father the late Richard Peele Esq. 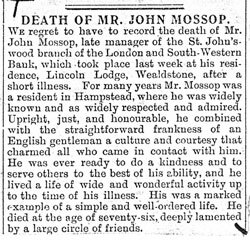 John Mossop was born in Long Sutton, Lincoln on 28th October 1830. He seems to have had at least three occupations. In 1851 he describes himself as a gentleman. On his marriage certificate in 1857 he was a Stockbroker. By 1860 he was a "glass manufacturer" on his son Henry’s birth certificate and on the 1861 census when he is living at The Butts, New Brentford, Brentford. By the 1871 census when the family was living at 6, Bank Buildings, Bank, his profession was "bank manager" which he continued to be until he retired. In 1881 the family was living at 7, Pembridge Villas, Wimbledon Park Road, Wandsworth. By 1891 he had moved to Pevensey, Fountain Road, Enfield. The 1901 census shows his new address is 129, West End Lane, Hampstead, and he died on 16 May 1907 at Lincoln Lodge, Wealdstone. In 1911 his widow's address was Lincoln Lodge, Headstone Drive, Harrow. He worked at the St Johns Wood Branch of the London and South Western Bank.